All the pieces are falling into place for your July 4 soiree. The only thing you need: a flag worthy of the moment. Something from 1876 will do. Presenting The Great Republic, a Colorado-based dealer in rare flags and Americana, now selling east of the Mississippi for the first time at Sterling & Burke Ltd in Georgetown. This is the kind of wall art that will make it very hard to accuse you of treason. And these aren’t just old—they’ve each got a story that you can regale your freedom-loving guests with. Like a 39-star flag, which never officially existed (the flag makers were gambling on the Dakotas being admitted as one state—the fools). 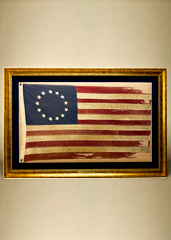 Or a Betsy Ross–style, 13-star flag originally flown by the Navy. And when you’ve got enough red, white and blue, you can also find wall space for an 1847 map of the US or an original planning map of DC (makes a great gift for a corrupt council member), or a wooden British pub sign from the 1920s. There’s no last call in your kitchen.